Add and update contacts to address books + Client activity. gwabbit Alerts is a simple email solution that lets professionals and assistants know about new and updated email signature contacts, enabling them to add them to their address books with one click. Alerts also offers a snapshot view of gwabbit Dashboard, providing email activity trends between the firm and key clients, people, industries, and practice groups. 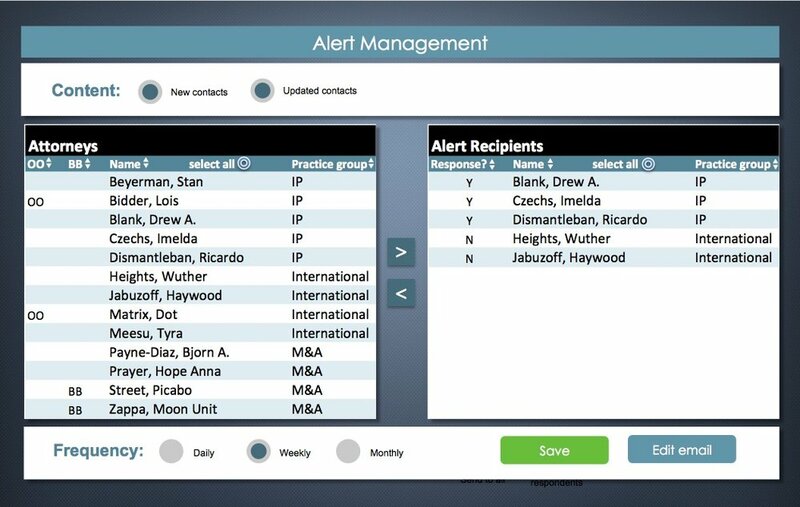 Alert Manager enables you to easily select distribution lists, email content and frequency. You can even private label the email to match your firm's branding! gwabbit administrators may customize the content, distribution list and frequency of gwabbit Alerts. Alerts may include any of the following: new contacts, updated contacts, and/or Dashboard thumbnails. Any or all professionals may receive Alerts on a daily, weekly, or monthly basis. Assistants granted Outlook delegate privileges may add or update contacts on behalf of attorneys.